As an architecture firm concentrated on ethics and principles of environmental design, it is important for our designers to be constantly learning about products and methods of design that create a successful, sustainable building. It is also important for us to exhibit this understanding of “green” design in order share knowledge with our clients and teams. 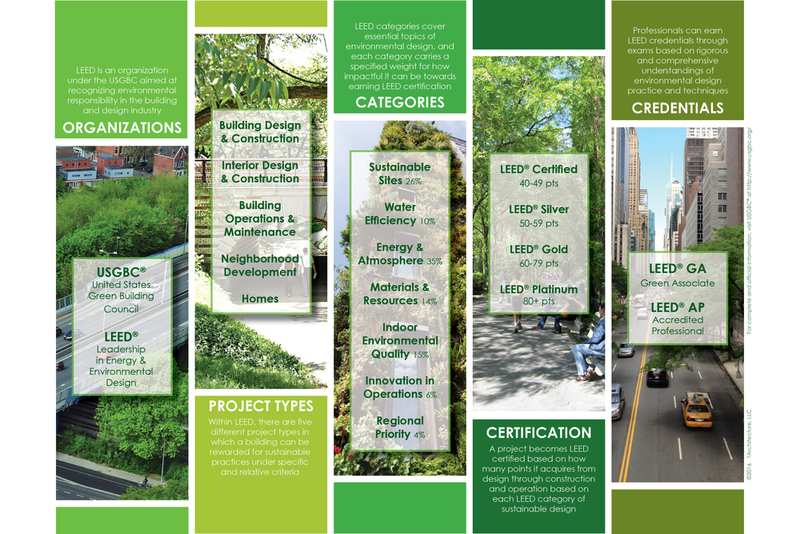 Throughout the process of developing a sustainable design, we will often reference “LEED®” efforts - but what do we mean? LEED®, an initiative of the US Green Building Council (USGBC®), stands for Leadership in Energy & Environmental Design, and aims to recognize and influence sustainable building solutions. A project can earn LEED® distinction for sustainable design implementation within one of five corresponding design divisions - Building Design and Construction, Operations and Maintenance, Interior Design and Construction, Neighborhood Development, or Homes. Recognition is earned through acquiring points across various responsibilities, such as water efficiency, indoor environmental quality, and innovations in operations. Project points are earned to acquire LEED® certification, and recognition ranges between four levels. The first degree acknowledges a level of basic adherence to LEED® principles. The scale works upwards in rigor and qualification to earn LEED® Silver, Gold, or Platinum recognition, respectively. Building projects of any size can qualify to earn certification, but it is important to thoroughly explore the economics and benefits of each level of award per individual project. Building professionals can also earn LEED® credentials by exhibiting comprehensive knowledge of sustainable design practices. 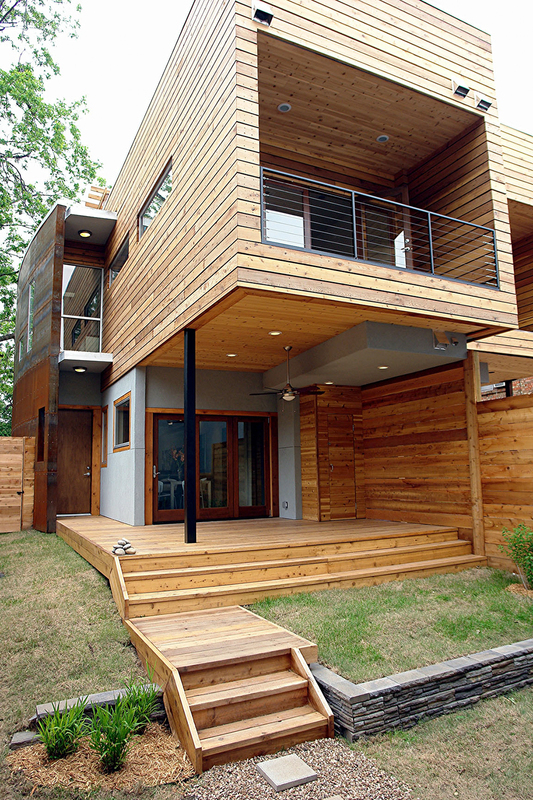 The Green Associate (GA) certification recognizes a professional’s fundamental understanding of environmental design. At a more proficient and skilled level, one can earn the distinguished title of LEED® Accredited Professional (AP). For most LEED® project certification, an AP professional must be an involved team member during the design process, to contribute expertise and project advisement. At 1Architecture, we understand and employ LEED® principles, working to bring efficient and responsible designs to the community. We designed Oklahoma’s first LEED® Platinum certified home, the NINE project, and have enjoyed working on many other awarded projects of various scale and program. Our experience and values in sustainable building practices allows us to provide our clients with productive and healthy environments with sustainable lifetimes and economically viable operations. For official and additional information about LEED®, visit http://www.usgbc.org/leed. 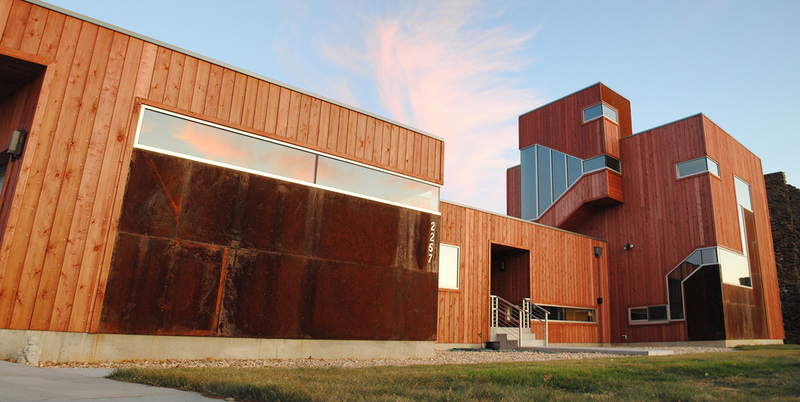 Check out our LEED® projects in the gallery below! © 2019 1Architecture, LLC. All rights reserved. Duplication or usage of the text, images, or other data and information contained in this site is not permitted unless authorized in writing by 1Architecture, LLC.